Cooling Conflicts is a program that works to empower school students to manage their own conflicts and to become leaders in conflict management in their school communities. The program allows students to explore, understand and manage a range of conflicts in the safe environment of drama, where the conflicts are fictional or the students’ own conflicts have been carefully distanced and dramatised. The program also involves peer teaching, which generates effective learning and high motivation, and empowers the students as teachers at the same time as helping them to fully understand the nature and management of conflict. The program has been designed by experienced drama educators informed by conflict mediation theory. Video overview of the program. The Cooling Conflicts program was devised by Griffith University Centre for Applied Theatre in partnership with the NSW Department of Education and Communities (DEC) and in association with the DRACON international research project into drama and conflict, based in the Peace and Development Research Institute in Sweden. Training for teachers in participating schools was devised and conducted by the researchers, supported by Multicultural and Creative Arts consultants from DEC. Until 2012, between 15 and 20 schools participated in the program each year. Training was provided by DEC officers and drama teachers familiar with the implementation of the program in schools. At this stage implementation of the program in NSW government schools is by individual teachers or groups of teachers using the handbooks available on this website. links to further information on this website pertinent to their role. The key class teacher’s handbook has a detailed description of the learning experiences that the key class students will undertake. This is because these students need to acquire the knowledge and skills that they are to pass on to their younger peers. The learning experiences of the focus and relay class students will be decided by their peer teachers based on the knowledge and skills the key class students have acquired. Coordination and communication are critical for the successful implementation of the program. The nomination of a Cooling Conflicts school coordinator will assist in the smooth operation of the program and minimise disruptions that may arise from its implementation. The school coordinator does not have to be an expert in drama and may not teach any of the participating classes. They will not need to read all the information contained on this website. The content of the School coordinators’ handbook should be sufficient for them to understand and fulfil their role in the program. The key class teacher provides the drama expertise and experience to the program. The Key class teachers’ handbook describes the role of the key class teacher in the program and sets out the learning experiences of students undertaking a unit of work that incorporates an understanding of conflict through forum theatre. Key class teachers will also need to consult other parts of the website related to teaching about conflict and building the educational drama skills that heir students will require to peer teach younger students. Focus and relay class teachers do not have to teach their students the drama techniques that assist in understanding and managing conflict. That is the responsibility of the student peer teachers from the older class. But focus and relay class teachers do have a role in preparing their students for their peer teaching, if they are themselves to teach younger children, and in integrating the learning their students gain from Cooling Conflicts with the learning of the classroom. Cooling Conflicts is about conflict management, not conflict resolution. The program entails peer teaching rather than peer mediation. This section sets out the contexts, elements and sources of conflict and describes how students in schools can learn to manage conflict through the use of educational drama techniques and peer teaching. Enhanced forum theatre is the central drama form used in the Cooling Conflicts program. The technique of theatre with active audience participation has been in use in educational theatre since the early 1970s. The specialised terminology is derived from Augusto Boal’s ‘Theatre of the Oppressed’. However, Boal’s standard forum theatre is aimed specifically at revealing oppression and exploring ways of countering it. In Cooling Conflicts, the technique has been adapted to explore conflict and conflict handling, making it possible for school students to actively experiment with conflict situations and with ways of managing a range of conflicts. The use of forum theatre has been further enhanced with the inclusion of key techniques from classroom process drama and extension beyond the forum. Students, especially those unused to drama activities, require the creation of a secure classroom environment in which they can safely express themselves. Warm ups and group activities help to build focus and confidence in students. In this section a series of drama activities are described to support teachers to create the trustful drama classroom. Teachers may wish to try out the activities by routinely using them at the beginning of the day or as a reward for the successful completion of class work. This section also describes two techniques that can be used to assist in the creation of enhanced forum theatre pieces. 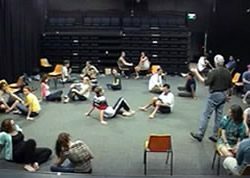 A number of techniques from process drama have been incorporated into enhanced forum theatre, the central dramatic form used in the Cooling Conflicts program. In addition to these techniques, key class teachers with more advanced drama classes may wish to introduce their students to a more comprehensive experience of process drama. This section describes how to implement process drama in the classroom, including a full range of process drama techniques. An example of process drama, Leaving Home, is also included. Community theatre-in-education is an optional phase of the Cooling Conflicts program. It entails the creation of a play for a public audience depicting conflicts that have arisen from problematic cultural issues of concern to the local community. To undertake this task, students will need to research community issues, talk to a range of community people who hold a range of views, and devise, rehearse and then perform a play for the community audience. The creation of a community theatre-in-education piece is time-consuming and will require extensive drama skills in the students and the support of teachers and the school. This section contains an academic article on the place of drama in education. It will be of particular interest to drama educators but also provides an insight into the history and philosophy of the use of drama in education suitable for a more general audience. To effectively implement the Cooling Conflicts program in and across classrooms and schools requires a thorough knowledge of the key drama techniques involved, and an understanding of the philosophy of the program. While experienced drama practitioners may be able to implement the program using the information and tools available on this website, it is recommended that schools seek out training from drama specialists, preferably those who have participated in the program at a school level. NSW government schools interested in participating in the program should contact the Equity and Multicultural Education team of the Learning and Leadership Directorate on 9266 8238. 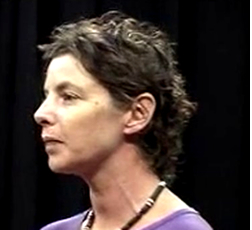 These video segments exemplify the drama techniques used in enhanced forum theatre, the central theatrical form of the Cooling Conflicts program.